I’m a professional drummer, percussionist, music writer, and teacher, and—yes—I’m pretty much obsessed with crafting seductive, danceable grooves. But I’m also a seeker of how drums and percussion can enliven all styles of music, from classical to rap to ambient. My journey has taken me from a Bachelors in Music with an emphasis in percussion (San Jose State University, 2004) to writing and arranging a piece for a percussion quintet (MANNERS), and co-founding Different Strokes Percussion (2002). I was also a featured soloist at the National Concert Hall in Taipei, Taiwan, and I taught seminars and held percussion camps during the tour. While back at my California home base, my teaching career has included positions at Foothill College (Los Altos), Community School of Music and Art (Mountain View), The Music School (Sunnyvale), U Music Percussion School (Fremont), The Harker School (San Jose), San Benito High School (Hollister), Live Oak High School (Morgan Hill), Gilroy High School (Gilroy), and Fremont High School (Sunnyvale). 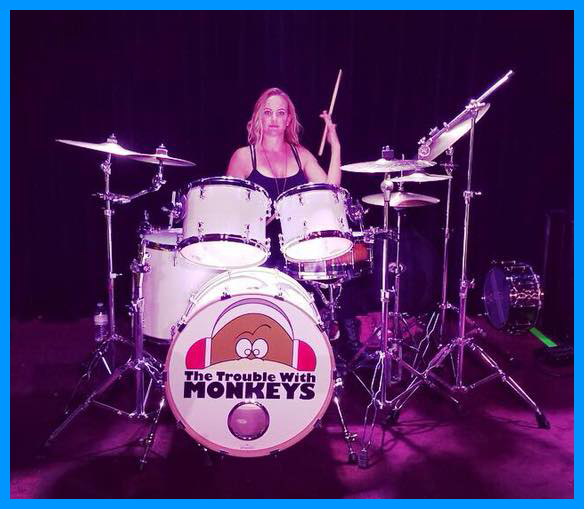 I’ve enjoyed a pretty high-profile career as an artist in the San Francisco Bay Area as drummer and co-founder of The Shebangs, drummer and founding member of The Killer Queens (an all-girl Queen tribute), drummer with Kung Fu Vampire (rap), drummer with The Trouble With Monkeys (a rocked-up tribute to the Monkees that is signed to the Mi5 Recordings/Universal Music Group label), and drummer for Flock of Seagirls (a tribute to the women rockers of the 1980s). As a writer and editor, I’m the gear-giveaway administrator and author of the “Raid Dana’s Stash” column for GUITAR PLAYER magazine, assistant editor of the GUARDIANS OF GUITAR brand (website and social networks), and editor/consultant for bassist Victor Wooten’s upcoming book. I’m always available for percussion seminars, teaching gigs (private and group), performance and music directing of musicals, and drum sessions (recording or live performance).